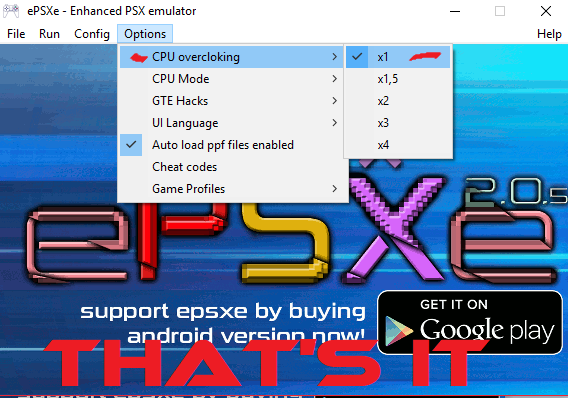 So you want to play your old ps1 games on your pc but ePSXe doesn’t work on it. It keeps going to a black screen and then crashing to your desktop. This very brief straight to the point fix will work wonders for you. 2nd. – Click Options > CPU overclocking > finally check off x1, and that’s it! It should work now! Don’t forget to get the SCPH1001.BIN or else it won’t work, they are easily found on the internet, but if enough people comment here I’ll upload it. Don’t Forget you may now go into video options and set them to your liking. PREVIOUS POST Previous post: The Grind in Role Playing Games – It’s Fun! NEXT POST Next post: Post #2 – The top Metroidvania games – Three more down!